Yeah, OK, I could get to like maps a little now. Maybe. Seriously, Tim did an awesome job, especially considering he got a lot of vague guidance from me like, “I can’t remember if those pokey things are mountains or canyons,” and “Can you make the tundra more tundra-y?” (I’m not kidding when I say I don’t do maps. Just not a very visual person; I have trouble transforming what’s in my head into a two-dimensional maybe-to-scale unavoidably distorted rendering.) I love the end result. ETA Paul’s actual maps site, instead of his illo blog! I just like maps. But I have to admit that as soon as I saw the plate boundaries, I squeed. Because figuring out what the hell is going on geology-wise with fantasy maps is one of those things that can drive me to frustration*. * Well, setting specific. Like, with the RPG setting ‘Uresia: Grave of Heaven’, it’s explicit that the current landmasses are a result of the abodes of the gods falling on whatever land or ocean existed previously, so I don’t expect it to make any sense without invoking large amounts of magic. Basically, authors can set the amount I should be suspending my disbelief by establishing sub-genre. Another one for my collection of fantasy maps, so aweome, thanks! Oh, latitude and longitude, not just an outline and a general idea that “north must equal colder, right?” I like it. Also, I like that you gave us a printable version here, because the version on my Kindle is sideways and tiny or upside-down, depending on whether I’m in portrait or landscape mode. I was going to squee that you were a fellow Kamala Khan/Ms. Marvel fan when I saw you using embiggen, then I did a bit of research before posting, and it actually goes back to at least 1884 and was brought back by the Simpsons (which I didn’t remember, despite having seen that episode, albeit many years ago.) So if you’re _not_ a fan of the new Ms. Marvel, I highly recommend checking out the first trade paperback at least. Great series. Less tangentially, a very nice map. Book purchased, and I’ll review it on Goodreads and Amazon once I’ve had a chance to read it. Love the map! Seriously, I love maps and want to thank you for posting the image hrre, since it foes not render well at all on my Kindle. Also, a hand for whoever is doing cover design for your newer books. I love all the architectural details, but then, I am reasly geeky when it vomes to things like that. Whoa! I totally take maps for granted as an immutable Fantasy Thing. I enjoy them, but I’m interested in knowing why you don’t like them. Like, just being limited by them in your writing or in all books? That would be the illustrious Lauren Panepinto, Orbit’s Creative Director, who’s done a phenomenal job on all of my books. Mostly I take to heart Diana Wynne Jones’ point about fantasy maps from The Tough Guide to Fantasyland: maps are spoilers. No one bothers to put irrelevant points on a fantasy map, so by looking at one you can see exactly where the action of the book is going to go. That’s certainly proven to be the case for the map of the Stillness, although I did try to throw in a few additional points just as red herrings to try and circumvent this problem. But you can’t do too many of those, because then the map becomes difficult to read. There’s also the fact that I don’t believe in Immutable Fantasy Things. All Fantasy Things are mutable. Including maps. 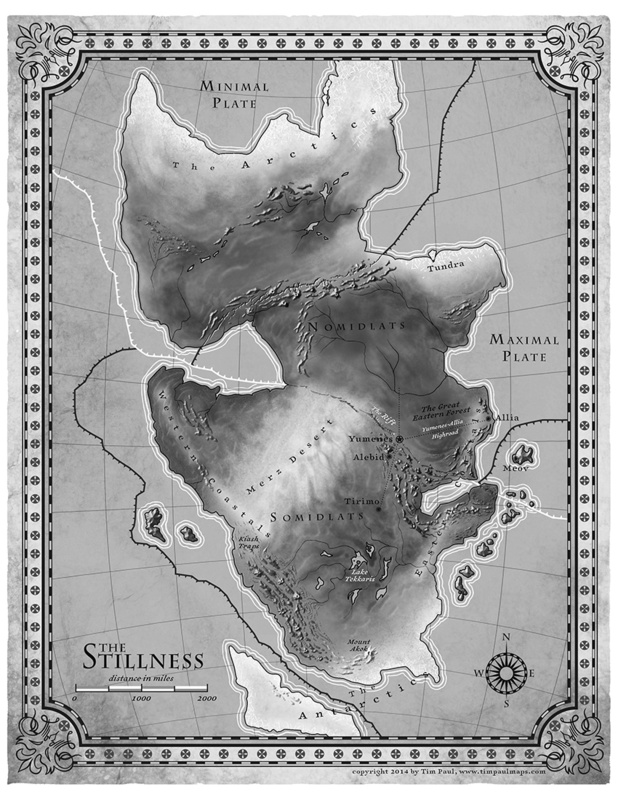 But in this case, the Stillness is so vast and different that I actually felt the spoiler effect was offset by the sense of wonder that seeing the map might add to the story. It was worth the cost, in other words. Many thanks for the link! She is very talented indeed. I love the concept with these newer covers.